Digipack.„New Laws, New Orders“ was originally an instrumental suite of Vladimír Hirsch, created in the beginning of 2000. Later, some of tracks from that composition were together with some unreleased pieces from the period 1996-1999 reworked as fully conceptual title of the ensemble. 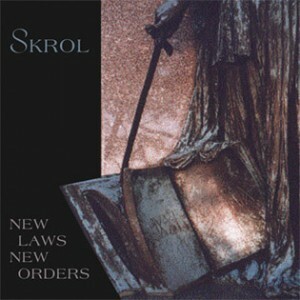 SKROL majestic and uncompromising music is based on specific melodiousness and orchestration of contemporary neoclassical music, situated in the arch of industrial ambient and brutalized by noises and modern technology sounds. This album represents some “swan song” of the band, that definitely discontinues the activities by it. Probably, that is why musicians eclectically capitalise here all the forms used until now.